If you have trouble viewing the newsletter below, click here. Bring Your Four-Legged Friends to Dilworth Park in August! National Dog Day is in August and Dilworth Park is celebrating with TD Bank! From 11am-1:30pm, August 30-September 1, stop by the Dog Days at Dilworth booth to check out a pet product retailer, ask questions of a professional trainer or learn how to adopt your own furry friend. Partners: Morris Animal Refuge, Philadelphia Animal Welfare Society and Red Paw Emergency Relief Team. Then, 5-7pm on Wednesdays, August 31-September 28, it's Yappy Hours! Pets and their owners are invited to come, sit and stay at the southern end of the park and join the Friends of Center City and Dilworth Park for CCD Sips-priced cocktails, featuring $5 sangria, $4 wine and $3 beer. Partners: Pennsylvania Society for the Prevention of Cruelty to Animals, Brûlée Catering, Philadelphia Animal Welfare Society, Morris Animal Refuge and Red Paw Emergency Relief Team. 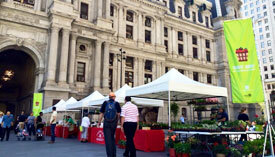 Get your fill of fresh from the Farmers' Market at Dilworth Park, Wednesdays 11am-2pm! Health is definitely in season and you never know what deals might crop up! Look for products from McCann's Farm and Mahogany Essentials, along with other special guest vendors throughout the season. Center City District Sips keeps going 5-7pm every Wednesday through September 28, with $5 cocktails featuring 2 Gingers, $4 wine, $3 beer and half-priced appetizers all over Center City! Over 80 bars and restaurants are participating, including the new Dilworth Park Café. Get the full list and specials at CCDSips.com. Sponsored by 2 Gingers and American Express. Center City District Restaurant Week begins soon! September 11-16 and 18-23, participating restaurants will offer three-course dinners for only $35 and three-course lunches for $20. Get the full list and menus at CenterCityPhila.org/restaurantweek. While on the site, you can also make easy online reservations through OpenTable and enter a contest to win 52 gift certificates from Center City restaurants. You can find out first about Center City District Restaurant Week news on Twitter: @PhilaRestWeek. A limited number of free ceremony-only tickets to the National Constitution Center’s Liberty Medal Ceremony honoring U.S. Representative and civil rights icon John Lewis will be made available to the general public on a first-come, first-served basis on August 17. The ceremony will take place Monday, September 19 at 7pm, at the National Constitution Center on Independence Mall. The free general public tickets can be reserved at ConstitutionCenter.org or by calling 800.439.9835, beginning at 10am. Guests are limited to two tickets per household. Due to high call volume, the National Constitution Center recommends reserving tickets online. On Tuesdays in August and September, 4-5:30pm, The Barnes Foundation offers visitors A Closer Look at the works of Paul Cézanne, who is often regarded as the father of modern painting. Take a comprehensive look at his life and achievements, including the monumental works The Card Players and The Large Bathers. There are 69 Cézanne paintings in the collection. The Prime Rib's most popular special, a 15 oz. prime rib for $25, is available every single night this August! Offer does not include sides, salads or dessert. No split entrée. Plus, every Sunday is BYO wine, with no corkage fee. Live jazz nightly. No dress code. Philadelphia's great transit system and pedestrian-friendly streets make car-free travel, shopping and dining easy in Center City! Get information on routes, fares, schedules and more, at SEPTA.org or RidePATCO.org.